Are you ready for Halloween? We'll try to help. 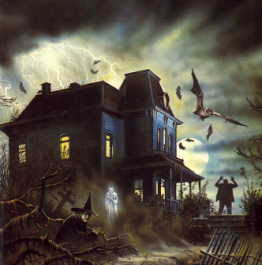 Everyday this month the blog will be updated with something new to help get you in the mood for Halloween. "For 30 days every winter, the isolated town of Barrow, Alaska is plunged into a state of complete darkness. It's a bitter time when most of the inhabitants head south. 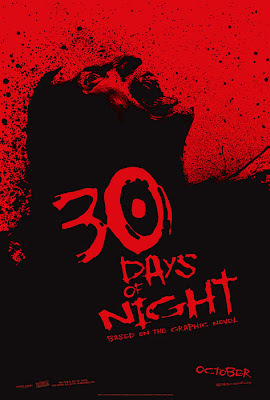 This winter, a mysterious group of strangers appear: bloodthirsty vampires, ready to take advantage of the uninterrupted darkness to feed on the remaining town residents." From SOTA Toys comes a set of zombies from George A. Romero's Land of the Dead. Each zombie comes with part of a diorama base as well as body parts of a victim ripped apart by zombie teeth. These body parts can be reconfigured into a 4th figure...missing a few bits here and there. 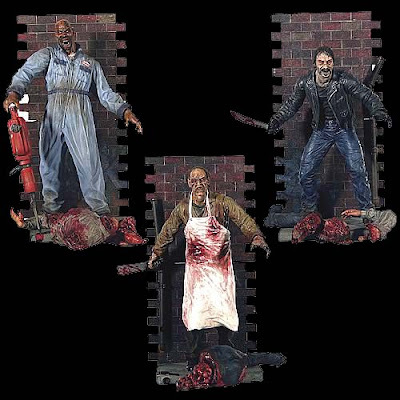 The set of 7 inch zombies includes: Tom Savini as Blade, Boyd Banks as the Butcher, and Eugene Clark as Big Daddy. This highly popular set is available through Entertainment Earth.